NOTES: You will need to start this recipe at least 1 day in advance because the bread cubes need to sit out for several hours (ideally a full day) to get a bit hard and stale. This helps them keep their form once you add the egg custard mixture. I like to cube the bread and then let the cubes sit in a single layer on a baking sheet on the counter. You will also want to let the casserole sit in the refrigerator overnight (or at least for several hours) before topping with the crumb mixture and baking. I usually prep the bread cubes in the morning the day before brunch and let them sit out to harden, then prep the casserole the evening before the brunch, and then top & bake the morning of the brunch! Do you need an idea for a Father’s Day brunch that feeds a crowd and delights everyone? Look no further! My philosophy used to be that it’s okay to eat things like this once in a while (and that’s still my philosophy, especially when it comes to REAL ice cream). But living in the same city as family, “once in a while” is actually “all of the time” between all of our birthdays, holidays, and other celebrations, so I wanted to surprise my family members with this much healthier anti-inflammatory version of our favorite breakfast casserole. This casserole has a custardy base, almost like a bread pudding, and the top is a sweet, buttery, cinnamony crumb topping that just takes the whole thing over the edge. I wish you could have been in my kitchen when this was baking off because it smells so decadent and delicious with wafts of cinnamon and butter. I think my next step will be to make this into a candle! Mmmmmm! 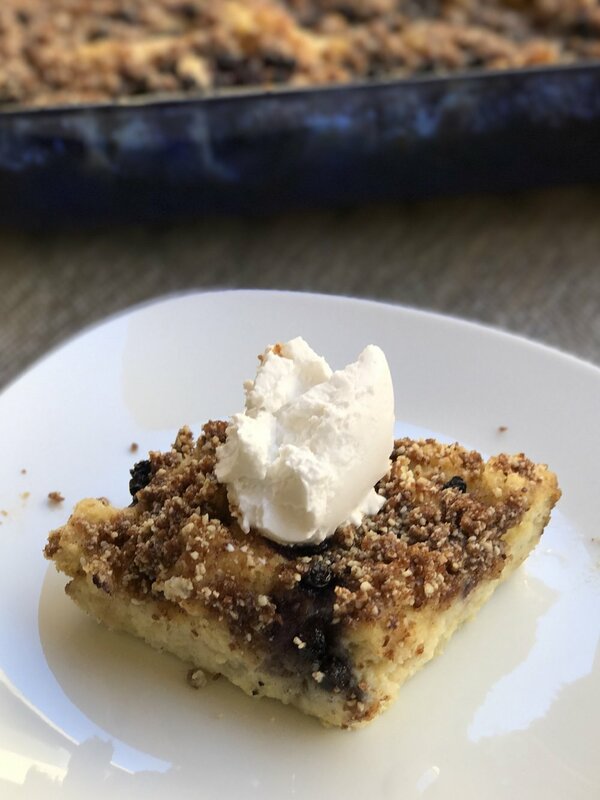 ope your dad and the rest of your family love this gluten-free french toast casserole as much as our family does! NOTES: If you can’t find a whole unsliced loaf of good GF bread, last least make sure your bread is organic. Same goes for the eggs. If pasture-raised is out of budget or not easily available, just make sure you’re using organic eggs. Lakanto sweetener is available on Amazon, but if you need immediately, I’ve seen it at Whole Foods and Sprouts. Also if you have a pastry cutter, making the crumb topping is much easier, and I highly recommend using it here. Place in the freezer before use to keep the blades cold. Coconut sugar IS sugar, but it has minerals that standard granulated sugar does not, and it’s less sweet than granulated and brown sugar which means your palate won’t crave super sweet foods. - 1C 4th & Heart ghee (or other ghee brand if not available), cut into small pieces and frozen for a few minutes. I like to add distribute 2 cups of fruit under the crumb mixture before baking. I find that berries like blueberries and raspberries work particularly well here. Feel free to experiment with apples, peaches, cherries…the options are endless! Frozen fruit works fine. I used frozen wild organic blueberries in these photos. Chopped roasted nuts also work really well here. Prep a 9x13” pyrex or ceramic baking dish with coconut oil spray and distribute the bread cubes evenly in the dis. In a large bowl, beat together the eggs, milk, monk fruit sweetener, and vanilla bean paste until well-blended. Pour the custard mixture over the bread cubes and push down on the bread cubes so that the mixture covers as much of the bread cubes as possible. Cover with plastic wrap and refrigerate for several hours, ideally overnight. In the meantime, you will prep the cinnamon crumb mixture which will also sit in the refrigerator overnight in a ziplock bag. In a medium sized bowl, combine the coconut sugar, almond flour and cinnamon until evenly mixed. Add the chilled butter and cut the butter into the flour mixture using a chilled pastry cutter (or fork if you don’t have a pastry cutter). The mixture should resemble small pebbles. The goal during this process is to keep the butter as cold as possible. If it starts softening, pop the bowl into the freezer for a few minutes, and then resume. Once the mixture is blended and looks like pebbles, put in a ziplock bag, and lay flat in the refrigerator overnight. The next morning, preheat the oven to 350, remove the plastic wrap from the casserole, evenly distribute a layer of fruit (if you’re adding fruit), and then evenly distribute the crumb mixture. Bake for 45 minutes for a looser custard, and bake for an hour if you want a firmer custard with brown edges. You can also par-bake the casserole the night before and pop it in to the oven again in the morning for 15 minutes. Another option is to make it the night before and then let it stand at room temperature for an hour before serving. It’s a very forgiving casserole. My favorite way to serve the casserole is a dollop of CoYo coconut yogurt (shown in photos) which is low in sugar and very creamy, and I find the tang is the best counterbalance to the sweet crumb topping. You can serve this casserole with fresh whipped coconut cream, Lakanto maple syrup, more fruit, there are so many options, get creative! I hope you enjoy this recipe post and would love to hear your comments! What is your favorite healthy recipe to make for family gatherings? ARE YOUR CLEANING PRODUCTS ACTUALLY DIRTY?